Turkey’s president Recep Tayyip Erdogan offered to free American pastor Andrew Brunson, imprisoned for allegedly spreading both pro-Kurdish propaganda and supporting Islamic cleric Fethullah Gulen despite being a Christian, in exchange for Gulen himself on Thursday. Erdogan did not appear concerned in his remarks that Brunson would engage in criminal activity if liberated, suggesting the main reason for his arrest was to be used as a bargaining chip for Gulen. “We have given you all the documents necessary [for the extradition of Gülen]. But they say, ‘give us the pastor.’ You have another pastor in your hands. Give us that pastor and we will do what we can in the judiciary to give you this one,” Erdoğan said, apparently addressing the United States. The Turkish newspaper Hurriyet notes that Erdogan did not explain when he had offered the United States to trade Brunson for Gulen. “They say, ‘don’t get involved with him.’ How come? You say you have a judiciary, do you think we don’t? Anyway, the one that we have [in our hands] is being tried, the one you have [in your hands] is not being tried. It is easier for you to give,” Erdoğan claimed. Reuters notes that Erdogan’s ability to negotiate such a trade is a power recently acquired through a decree passed in August, which allows the president to trade foreigners detained in Turkey “in situations required by national security,” even if they have not been fully processed by Turkish courts of have not completed their sentences. The Turkish government has accused Gulen of orchestrating the failed coup against Erdogan in July 2016, charges Gulen denies and Washington claims there is no evidence for. Turkish prosecutors are seeking over 3,500 life sentences for Gulen. Gulen is the leader of an Islamic movement known as Hizmet, which runs a network of charter schools in the United States and abroad and is referred to in Turkey as a the Fethullahist Terror Organization (FETO). Gulen lives in Pennsylvania and denies any involvement in the coup. Brunson was arrested in October 2016 on charges of “membership in an armed terroristic organization” for allegedly allowing Kurdish Turks to participate in his Christian services. 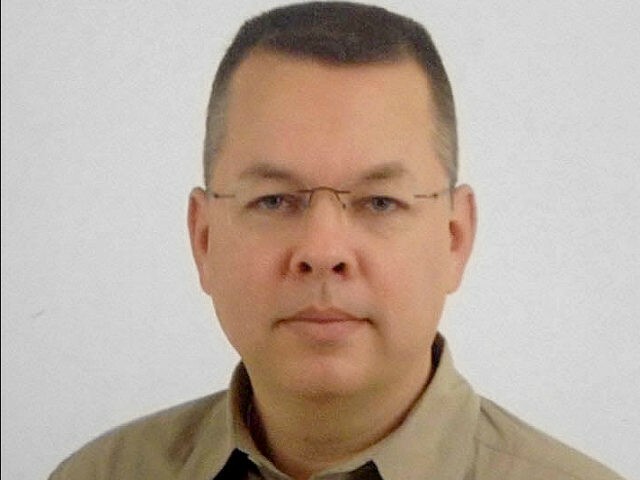 In May, Turkish prosecutors charged Brunson specifically with delivering sermons in favor of Kurdish political movements as well as working against the Turkish government on behalf of Gulen. Prosecutors have not specified how they reconcile the fact that Brunson is a Christian with his alleged support for an Islamic cleric, or how the pastor allegedly promoted Kurdish separatists while preaching Christianity. President Trump discussed Brunson’s arrest during an in-person conversation with Erdogan in May, when the Turkish leader visited the White House. “President Trump raised the incarceration of Pastor Andrew Brunson and asked that the Turkish Government expeditiously return him to the United States,” the White House said in a statement at the time. Erdogan reportedly also demanded the extradition of Gulen during that meeting, but the Trump administration has not moved to arrest Gulen. Following Erdogan’s failure to convince Trump to extradite him, Turkish officials began bargaining the U.S. government down, suggesting they could place Gulen on house arrested. “If you are saying ‘This is a judicial process,’ then you should arrest the man where he is and if you’re not extraditing him to us, at least limit his activities by bringing him under house arrest,” Deputy Prime Minister Numan Kurtulmus said in July.